CDAC student Walter Uhoya (University of Alabama – Birmingham) and colleagues from ORNL, LLNL, and the University of Alabama, have shown that the structure of iron-based superconductor EuFe2As2 expands under pressure. 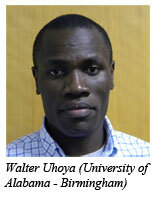 In a paper published in the Journal of Physics: Condensed Matter, Uhoya, et al. report structural studies at HPCAT using designer diamond anvil technology for electrical resistance measurements under pressure. EuFe2As2 crystallizes on a tetragonal lattice at ambient conditions and contains FeAs4 tetrahedral layers in the structure. X-ray studies reveal a surprising increase in the d-spacings of some of the Bragg peaks with pressure, as compared to the decrease in d-spacings that would normally be expected under compression. EuFe2As2 forms a collapsed tetragonal structure above 8.5 GPa, and shows normal compression behavior above this pressure. 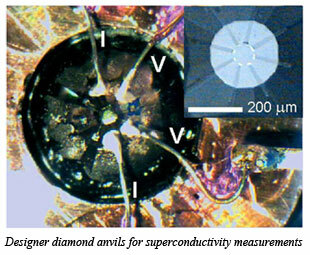 The group also investigated the onset of superconductivity under pressure using designer diamond anvils (see figure) and showed that the superconducting transition temperature (Tc) increases rapidly from 22 K to 41 K within the region of negative compressibility. With an increase in pressure beyond 10 GPa in the collapsed tetragonal phase, the transition temperature is lowered. The group has further shown that this negative compressibility phenomenon is common to iron-based superconductors of type MTM2As2 (M = Ba, Ca, Sr, Eu and TM= Fe, Co) results provide important input to the theory of superconductivity in iron-based superconducting materials. [Uhoya et al., J. Phys. : Condens. Matt., 22, 292202 (2010)].